Three of Cups (R) indicates that you need to balance your emotions now – you are being too overbearing – placing “conditions” on your expressions of love. You tend to do everything in the extreme – you work too hard or you play too hard and you must now learn to balance the two. Recognize when circumstances are changing – when what was good begins to cause pain, the loss of happiness, the failure of a friendship or disillusionment when you find that your friends did not support you when you needed them. Never dwell on what is happening. Turn right around and concentrate all your energies in a new direction. Experience your emotions completely and once the grieving process is over – straighten up and take charge of your life again. Create new plans, fill your life with new interests. Make a conscious decision not to feel sorry for yourself – you have much yet to accomplish. Communicate the abundance of your feelings in ways that nurture, comfort and motivate other people and this will generate tangible abundance for you. An emotional or creative block – problems with what has issued from your emotions or creative projects. The proper function of the mind to push you forward emotionally, to tempt you and it will be a force to be reckoned with. An unwanted child or pregnancy. Not wanting what love can bring. Infertility, abortion, even having/wanting the pain that can come with love – unrequited love, grief, sadness. How have you been enjoying yourself? How do you relax with others? What is bringing you joy? What talents do you have and how have you been using them? What do you want to communicate or share with others? What cause is there for celebration in your life? Next to Hierophant: Indication of an unusual or unconventional gathering or meeting. Next to Death: Complete change in lifestyle – like starting all over again. 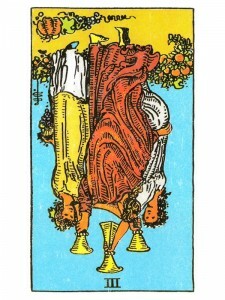 Next to Temperance: Take your time now – adapt yourself to the new experiences and get accustomed to the exciting changes. In the first position: This can indicate the uniqueness of the path in fulfilling this archetype of karmic purpose. The definition of “family” or “happy issue” may be unconventional, including the paradoxical combination of a hedonistic, yet familial lifestyle as the productive fruit. This life may require not having biological offspring. In the second position: Your greatest physical/material resources come from what you have produced from your emotional/ creative partnerships. For instance – one’s children and the physical/material assistance they offer. This suggests that some aspects should be improved to strengthen your foundation before proceeding. In the third position: There may be a delay, adjust your expectations in your Emotional Plane. Or, the product of your labor may be other than anticipated, possibly much more or much less. In the fourth position: This ideal may be in some extreme form, either of wanting to produce in quantity or of not wanting to produce at all. In the fifth position: You may want to delay or stop any emotional new seed at this point. But the opposite could also be true; you may be planning for growth in degrees or ways that are excessive. You cannot force joy or sadness; they are the results of intricate, long-term interactions. In the sixth position: Do not try to cast too many characters in your play or try to throw too many clay pots on your wheel. Or, the opposite extreme, do not hold back and limit yourself unnecessarily. In the seventh position: You may have fears related to your projections from love or you may be completely lacking in even reasonable concerns in these matters. In the eighth position: Neither let too much joy distort the moment of fruition, nor too much sadness a moment of disappointment. In the ninth position: Either the heart is passionately obsessed with this potential for emotional growth or it desires the reverse. It may want to maintain the status quo for the moment or in extremes, it may actually want a reversal or diminution of the emotional package. The heart may want to simplify its world. In the tenth position: This is what you must accept in your emotional/creative affairs by the end of this next year, as purposeful and good in your Karmic Contract. It will be much more or much less than your heart had hoped for. Possibly, you will be infused with the urge to loosen up and expand or you will be encouraged to cut back and accept a slower pace for a time.